Lying off the coast of Italy between Rome and Naples, the Pontine Islands are not very well known outside of Italy; it seems as if the Italians want to keep them all to themselves, and it’s easy to see why. Crystalline seas surround craggy islands of dramatic beauty; sleepy villages spark into life during the high summer when the Roman elite decamp here en masse. 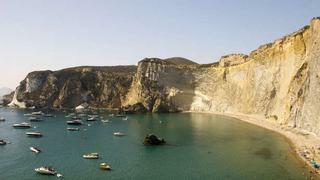 The island of Ponza is their favoured destination: the harbour is formed like a natural amphitheatre of houses encircling the protected bay and the rest of the island is a series of jagged headlands, pale gold beaches, secluded coves and secret caves. The Etruscans carved out grottoes here; the Romans vast tunnels to reach the lovely beach at Chiaia di Luna bay and many other cultures including the Phoenicians and Egyptians have left their tombs and monuments behind. Like many Italian islands, Ponza is volcanic in origin, but is merely the remnants of a long-since extinct caldera, so there is no risk of eruptions and the water is very clear. Zannone lies close to Ponza: this islet is part of the Circeo National Park, so no tourists can stay here overnight, there is a Forestry Service base, and visitors can explore the ruins of the 13th century convent and hike amidst the scrub, evergreen oaks and perhaps even meeting a wild mouflon; a type of sheep. Palmarola is also close to Ponza, and although it is the second largest Pontine island, it is largely uninhabited, making it perfect for swimming, diving and exploring by boat. Ventotene at the eastern end of the archipelago is best explored on foot; it does have cars, but vehicles are only permitted to operate one hour before and after ferry arrival times. Otherwise peace reigns. The volcanic tufa that the island is made of is easily cut into building blocks. You can still see how the Romans made good use of it to construct vast villas, as well as rainwater catchment and cisterns to harvest rain (there is no other source of freshwater on the island). Naples, Italy’s third city, is a stark contrast to the peace and tranquillity of the islands. What may seem messy and chaotic from the outside can be thought of as a reflection of the vibrancy of this city. Neapolitan cuisine is probably most famous the world over for pizza – and it’s well worth sampling the original here, as well as some great seafood and spicy sauces imbued with chilli and garlic. Ponza is spectacular, particularly at sunset when its sharp-crested cliffs coloured with a multitude of pastel hues, leap vertically upwards from the sea. Places to anchor, swim and dive can be found all round the island while the town of Ponza itself – a charming place to window shop for souvenirs or enjoy an alfresco meal – overlooks a vast harbour and anchorage.